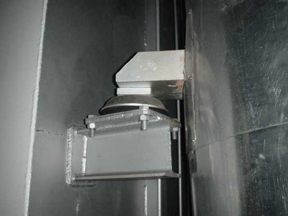 Standing Fixed Points are vibration isolation mounts for exhaust piping. These mounts are designed to support the pipe while isolating vibrational energy in the exhaust system so it doesn't enter the vessel's structure. 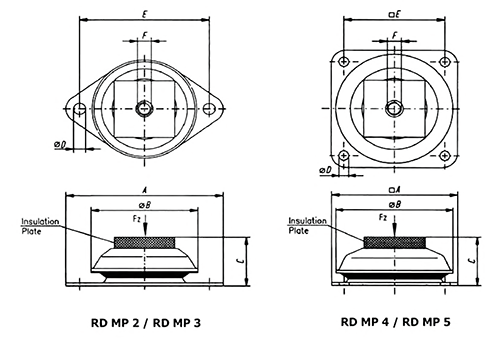 For best results, standing fixed points are used as a component of a Exhaust Stack Isolation system. This system also includes other styles of exhaust mounts, flexible stainless bellows, fire- and water- tight penetrations, and rain caps. See our section on Exhaust Stack Isolation for details. Here are specs for the two standard shapes' Standing Fixed Points. Additional options are available for loads greater than 36kN.